The Revolutionary High-Pressure Clean In Place Hose Pump! As the leader of innovative peristaltic hose pump ALBIN PUMP has developed a solution for easier and better clean in place hose pumps. ALBIN PUMP has developed a specific and a unique wheel to meet the requirements of its industrial customers from food, cosmetic and pharmaceutical industries. The new ALH CIP pump has a patent pending designed pump-wheel that will allow the pressing shoes to retract (not to compress the pump) for an efficient clean in place process. 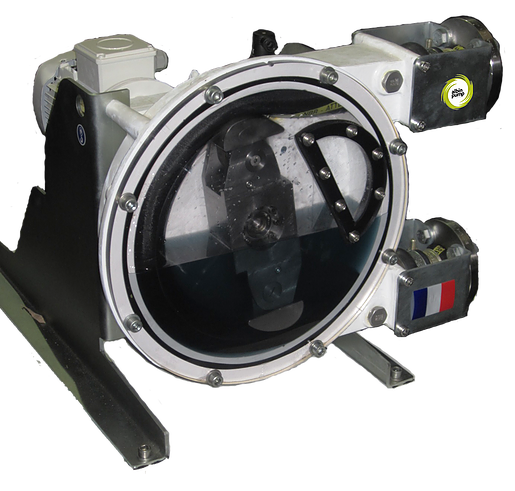 ALBIN PUMP can in their range of peristaltic ALH pumps offer the option “CIP wheel” (Clean In Place). It allows users, by simply reversing the direction of rotation of the pump (½ turn), to be able to retract the shoes automatically, in order to make the cleaning and sterilization operations, without any action on the pump. The client saves time and will keep the highest level of functionality in the process. The design is done with a minimum use of moving parts and requires a minimum amount of maintenance, all to guarantee a maximum amount of function and production time. The new CIP wheel in combination with ALBIN PUMP world leading design and exceptional long hose lifetime creates even more effective production processes. The ALBIN PUMP Peristaltic pumps are used for the transfer of all type of fluids: viscous, abrasive, corrosive and fibrous with particles. The advantage of this technology is that it does not damage or shear the pumped fluid while maintaining a high level of hygiene. Only the inner part of the hose NR FDA, EPDM FDA or NBR FDA is in contact with the pumped fluid. ALBIN PUMP can offer food grade hoses in EPDM FDA, NBR FDA and NR FDA and meet the certifications EC 1935/2004 and FDA CFR21§177.2600. The internal of the hose is white (NR FDA and EPDM FDA) or black (NBR FDA), according to the pumped fluid. The “CIP wheel” is now available on several models, for flows from 0.5 up to 10 m3 /h and where the maximum discharge pressure can reach 15 bar. ALBIN PUMP Peristaltic pumps are seal less and can run dry without damage. With the new ALBIN PUMP ALH CIP series we are providing better pump solutions.